For all the talk I’ve heard about people being scared of change, I have the privilege of being surrounded by people who crave it. This is what I thought as I received a very special email in my inbox. It was from Maria del Carmen, our compañera in Guatemala, and I got her permission to share it with you. At this time back in 2013, I was thinking about what to do with my dream of pursuing a university career. The possibilities I had were very few: one of them was to pursue a teaching career since that was the only major I could pursue at the University of San Carlos (the public institution), and the other was to stop studying for a substantial amount time, allowing me to save and eventually to pursue my dream of obtaining a university degree. Thanks to Libby, Joanie, Katie, Jake and the team, I made my dream come true: I was able to continue studying without having to take time off. Today my heart is full of joy, because I have completed five years of university studies, and I HAVE EARNED my degree in Business Administration! That dream would not have been achieved without your support. My family and I thank you very much for the great support that you all have offered to me. Philanthropiece is changing lives for the better, transforming us into changemakers who care about our community. Next to you all, I have learned so much, and will never, ever forget what you have done for me. I plan to continue to pursue my studies, and I promise I will not let you down or betray the trust that you have placed in me. I am writing to you all to share my happiness, and that of my family. Thank you very much! Carmen has a younger sister who is just completing primary school, and has a newborn son, Teo. I thought of them immediately upon reading her words, knowing that her achievements now will have ripple effects for generations to come. 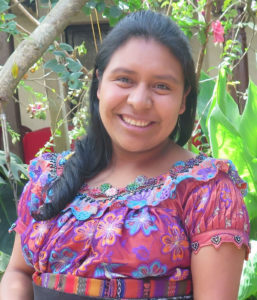 Carmen is a role model, and a true changemaker, a leader who is fighting to improve access and opportunity for Mayan youth, who is paving the way for women to be excellent mothers and influential professionals in Chajul, and who is creating an innovative model for how development organizations operate in Guatemala. This is a special moment for Carmen as well as for Philanthropiece. Her accomplishments and evolution are evidence of impactful programming. We feel confident that our resources are being put to excellent use—that with our time, energy, and funds, we are creating avenues for changemakers to make a difference in themselves, their families and their communities. What remains now is for us to better understand the impact that we are making with initiatives in Mexico, Guatemala, and Colorado. We are asking ourselves: To what extent are we making individual and interpersonal impact? How are we—or can we—play a role in systemic change? How might we articulate a consistent approach? How might that support us in allocating resources? And, how do we sustain all elements of our work within the current parameters of our capacity? These questions evidence the fact that, as both individuals and organizations, we are constantly investigating the theme of change. How do we know if we’re doing things “right?” How do we know what’s working and what’s not? We have strategies: we compile and revisit resources; we send monthly letters to our Board; we have Yearly Reviews, timesheets, weekly reports, program evaluations, resolutions, and trip summaries. But sometimes the simplest answers are the ones we never actually went looking for. I’ve found that change comes in small, almost-unnoticeable increments. As we turn ourselves towards movements, we just almost pay attention to moments. Small stories. Conversations. As Maria del Carmen shows, this is where our resilience lies. Katie Doyle Myers is Philanthropiece’s Executive Director. She has two sons, Phineas and Leo, and loves sharing professional motherhood with Maria del Carmen and the other Filantropis mamas. Edited by Raye Watson.